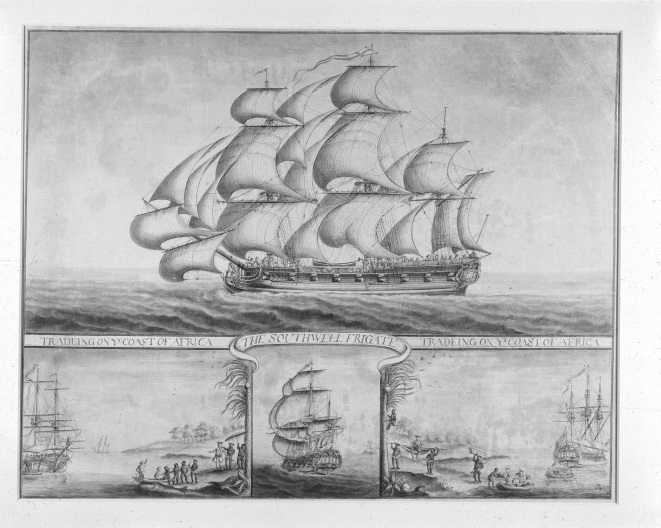 The Southwell Frigate Tradeing on ye Coast of Africa, attributed to Nicholas Pocock, date unknown, Bristol Museums. 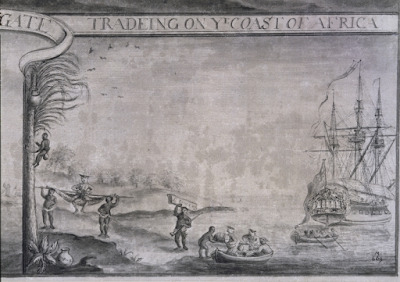 In a rare depiction of the eighteenth century slave trade, the artist has depicted a frigate collecting enslaved people on the coast of Africa. 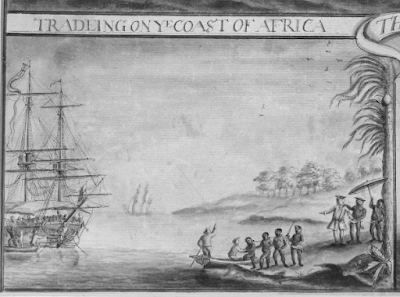 It is possible that the shoreline depicted in Malembo, which the Southwell visited on her second voyage in early 1749. PortCities Bristol suggests that this may have been sketched around 1760. That would make sense if Pocock is indeed the artist. 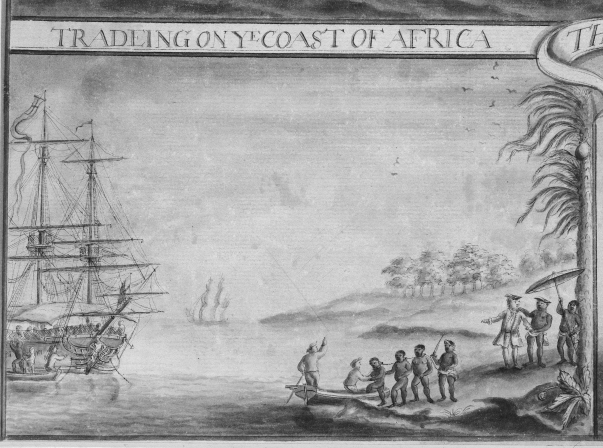 Pocock was born in 1740, and would have been far too young to depict the Southwell during her two voyages to Africa in the mid to late 1740's. This does raise the question of why Pocock would choose to portray a vessel and a voyage that was largely unremarkable for the time, especially more than a decade after the event. 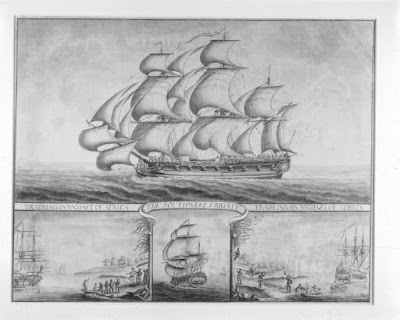 Pocock's father was a sailor, so perhaps he had served aboard one of these voyages and inspired Pocock's later illustration. This will require more research. Regardless of when or why the scene was chosen, it gives us a look at the day to day operations of the transatlantic slave trade. The artist chose to show the trading of more than just human beings. In the lower right, he shows the captain being carried by two Africans, and goods being brought to the boats in boxes, casks, and pots. 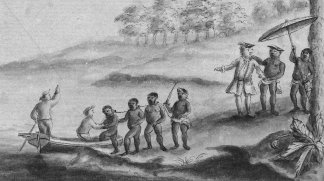 The box being carried on the head of the African armed with a musket is marked "Bristol." According to the catalog entry for this sketch at the Bristol Museums website, "the long crate probably carries muskets." In the boats, the sailors of the Southwell wear jackets that end about the top of the thigh, cocked hats (at least one of which is worn reversed), and what might be a jockey style barge cap or two. 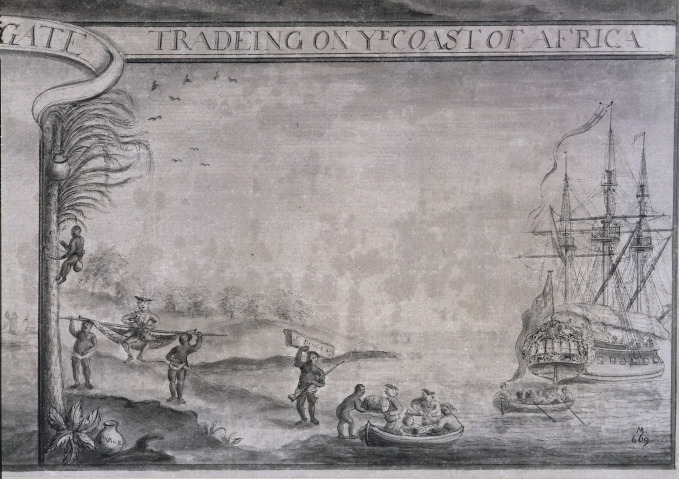 The bottom left shows a more traditional scene on the African coast of sailors hauling enslaved people to the ship. Bound by the neck, the enslaved Africans are loaded onto a waiting boat under the watchful gaze of the captain. The ship is crowded with enslaved people who are crammed on the main deck. According to the Slave Voyages Database, the Southwell loaded 779 enslaved people on her first voyage, which must have been dangerously overcrowded. Standing at the stern of the jolly boat, the coxswain wears a jacket without vents and a pair of trousers. His head is topped with a round hat or cocked hat. His mate wears a cocked hat and jacket, but it is unclear if he wears petticoat trousers, trousers, or breeches.